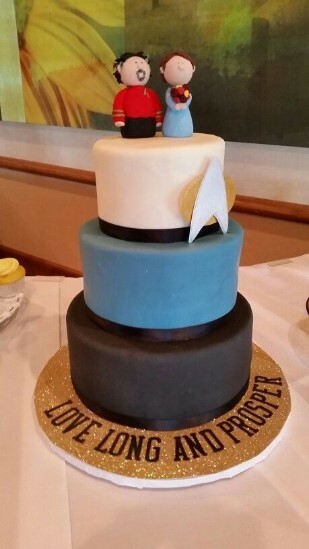 A Star-Trek-themed wedding cake. It has the Starfleet badge, cake toppers of a man and woman in Starfleet uniforms, and the words "Live long and prosper." Image source. HEY DID I MENTION HENDRIX AND I GOT MARRIED THIS YEAR? As an ex-evangelical, ex-purity-culture feminist, I figured I would have a lot of opinions about experiencing the actual reality of a wedding and all the ways it's different than the "ideal" I was taught in purity culture or absorbed from mainstream society. So I said I was going to write a LOT of blog posts about getting married. And I did. I Don't Expect My Wedding to be "The Happiest Day of My Life"
You know that whole "white dress means virginity"? Yeah, not actually a real thing. He's Not "My Future Husband"
So I Gave My Fiance the "Letters To My Future Husband"
I'm dating a nonchristian and I want to marry him. Here's why I believe that's not a problem.